time, United States could not maintained secrecy of covert roles, its intelligence agencies have been playing and people like Edward Joseph Snowden and Julian Assange of WikiLeaks , leaked out many things to global media, to the dislike of U.S. In Pakistan, there is a free media with the potential to access any state’s secret and exploit that at will. The role of Pakistani media in last one decade has been much wanting then desired. The code of conduct fixed by Governments has hardly been followed by most of the private media channels. So much so at times, there has been embarrassment to the Government and its agencies and organizations owing to misreporting and premature leakage of some information, which otherwise were to be kept confidential. In one of his recent article, Abbas Nasir, an established journalist and eminent writer advised the Government and military authorities to have a greater interaction with media in order to have a better image and close coordination, before taking any action against the terrorists and terrorism. The article entitled, “need to win media war” cites the examples of Swat-Malakand and South Waziristan Agency (SWA) on the one hand and tacking of the Lal Masjid operation on the other hand. The much desired military operations in Swat and SWA went well, whereas, the Lal Masjid operation had created a ruckus, locally as well as internationally. This bungled and improperly reported military operation created a negative impact among the masses, and TTP, the banned terrorist organization exploited those public sentiments in its favour. Today, what Pakistan is facing in the form of enhanced wave of terrorism, has the major share of the fallouts of the Lal Masjid operation, misreported by local media and further projected negatively by global media. It is true that, Pakistani media played an impartial role during the Swat-Malakand and South Waziristan operations and extreme pessimistic role (by some media houses only) in case of Lal Masjid. Indeed, there is a great difference between perception and reality. Then, there is even greater difference between a misperception and the ground realities. Media in fact has an important role in the making and at time changing perceptions. This all is done through the formulation of opinions about an issue or series of issues. In some cases, there are well orchestrated and thoroughly planned campaigns launched through media under vested interests of particular force(s). After attaining the desired results against opponent(s), it is found that, reality was entirely different from what it was portrayed. US invasion of Iraq is a case in point, where the allegation was that, Iraq had the Weapons of Mass Destruction (WMD); later on it was revealed that, there were no WMDs in Iraq. The US and western media considered itself justified, as it feel that, such a media campaign was in the best national interest of US. Pakistan’s nuclear programme has been subjected to hostile propaganda, linking it with psychologically premeditated threats and oblique-angle-vision to project it unsafe and perilous for the region. Propagandists people like, Michael Kugelman naively argue that Pakistani nukes may fall in the hands of terrorists attacking sensitive air bases in Pakistan. These propagandas are aimed at depicting Pakistan’s nuclear weapons as hazardous and risk prone. The fact of the matter is that, Pakistan’s nuclear assets are highly secured and under very responsible authority. These propagandists have never projected the bone of contention of nuclearization of South Asia; the Kashmir dispute. If today, Kashmir dispute is resolved, nuclear arsenals of Pakistan and India will become irrelevant. If people like Michael Kugelman have tried to create misperception about Pakistani nukes, there could have developed counter arguments based on fact and ground realities from Pakistani media houses that Pakistan has an unmatched command and control system of its nuclear arsenals. However, in most of the cases, Pakistani media sided with these global misreporting. Similarly, either as a state policy or through its own dedication, Indian media has strictly followed the themes of protecting and projecting Indian national interests. At the same time, Indian media has launched a well planned campaign against the very ideology of Pakistan, its armed forces and intelligence agencies. Even the private Indian media follow the nationalistic themes and daringly but proficiently cover the brutalities of Indian security forces in occupied potion of the State of Jammu and Kashmir and some of Indian states. Despite killing over 100,000 innocent Kashmiris through state sponsored terrorism, Indian media could sell the soft image of India and project Pakistan as “terrorist-exporting” nation. 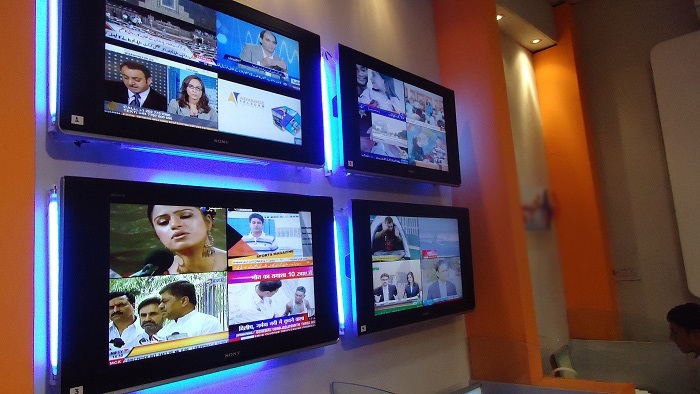 International media very expediently picks up stories and themes of the Indian media for a global broadcast. Following the OBL episode, once U.S and global media started a defaming campaign against the armed forces and ISI, the local Pakistani media directly and indirectly supported these global media narratives and kept bashing security institutions even long after this happening. Earlier sequel to Mumbai attacks, some Pakistani media houses supported the Indian allegations against Pakistani intelligence agencies. In fact, at time, it is felt that; Pakistani media is in a state of constant war with the armed forces of Pakistan. In the case of Balochistan disturbances, media has misled the people of Pakistan against the so-called excesses by security forces. Whereas, the real force and factors behind some killings of Baloch people are still to be ascertained for any authenticity. The allegations of the local media are then picked up by global media for exploiting the armed forces and intelligence agencies. Ironically, Pakistani media never highlighted the sacrifices and the numerous contributions for the development of Balochistan and FATA. Over the past few years, Pak Army and other two services, made lot of contributions in the field of; education, health, mining, provision of jobs in Army, infrastructural development and other socio-economic development. There has been recruitment in Pak Army of over 21000 Baloch youth in last ten years. With the new intake, the Baloch representation in Pak Army has raised from 1.7% to 3.5%, indeed, an unprecedented increase of Balcoh youth in this institution. In the educational sector of the province, Army has contributed maximum. As per estimates, “over 20‚000 Baloch students have been enrolled in various educational institutions, being run by Pak Army and Frontier Corps. Besides, “approximately 4,000 children benefited from the army-sponsored Chamalang Project in northeast Balochistan.” In 2006, Pak Army took initiative to revive Chamalang Coal Mines project, which was disputed ever since 1980s. After its resolution under Pak Army, 73500 individuals of Luni and Marri tribes were provided job opportunities and 2000 individuals were employed as guards. Military College Sui (MCS) was established by Pak Army for imparting “quality education and wholesome training to the youth especially of Balochistan in order to make them responsible citizens, dynamic future leaders, and versatile professionals with a view to bringing them in the national mainstream.” Special ISSB classes have been arranged by Southern Command to encourage the educated youth to join Army as commissioned officers. Similarly, Pak Army alongside local administration has contributed a lot in the development of communication network and projects of socio-economic development in FATA. Regretfully, local media has hardly projected these positive and indeed the unprecedented contributions of armed forces of Pakistan. In fact the commercial orientation, where money is everything and war for ratings and the competition among various media houses has led to the misuse of media in Pakistan. At time, it is realized that there is no code of conduct for the media in Pakistan. The unhealthy competition, as who will be the first one to break information (Breaking News) has been most treacherous for the people and embarrassing for the state. In this regards, what it has been observed that in most of the cases, the commercial and personal interests have outweigh the social and morale responsibilities, disregarding the fundamental requirement of objective reporting and journalistic ethics. Resultantly incorrect and biased reporting is done which leads to creation of mistrust, uncertainty and formulation of misperceptions, thus, damaging the national interests and tarnishing national image and pride. Whereas, the freedom of media is desired but media has to respect the moral and social obligations, the people and state has imposed on it. Owners and anchors of the media channels should be aware and conscious of the agendas of rival powers and unfriendly global forces towards Pakistan, its institutions, nuclear assets and above all its national interests. Today, Pakistan is facing multiple challenges like; terrorism, internal disorder, political instability, ethnic and sectarian divide, power and energy crises, poor governance, lack of speedy and fair justice, and separatist movements and psychological flinches leading to social digression. It has become more important that, any information communicated through media to the masses should be well researched, authentic and presented in a way to create positive image in the society. The projection of events and even the most horrendous and pessimistic incidents should be in such a way that, the society especially the youth get a positive lessons. Indeed, as the most influential and rapid means of communication, media has a responsibility to create a sense of belonging and national integration among the people. At a time once Government is carrying out, dialogue with TTP, the media need to show more mellowness and responsibility by projecting the positive and futuristic impact of these talks on Pakistani society. Like other three pillars, after all media has to act as the most responsible pillar of the state of Pakistan.